Several different methods can be used when treating polluted stormwater runoff. As water flows over impervious surfaces, like driveways, sidewalks, and streets, it gets contaminated as it picks up debris, chemicals, dirt, and other pollutants left on the ground. This polluted water then flows into catch basins or storm sewer systems and is discharged untreated into the waterbodies we use for swimming, fishing and providing drinking water. Polluted stormwater runoff has many adverse effects on plants, fish, animals and people, and often affects drinking water sources. Polluted stormwater runoff is one of the biggest sources of water pollution in the Neponset Watershed. Before the landscape was developed, far more rainwater would seep into the ground and be filtered by soil, plant roots and microorganisms, before joining the groundwater or seeping from the soil into a waterway. Today, realizing just how much of the ground has been covered in impervious material, communities are incorporating stormwater-cleaning structures, called BMPs (Best Management Practices) into the built landscape. What Are BMPs, and Why Do We Need Them? Best Management Practices either can be structural or nonstructural, and as simple as cleaning up after your dog or as complicated as building a man-made wetland system. 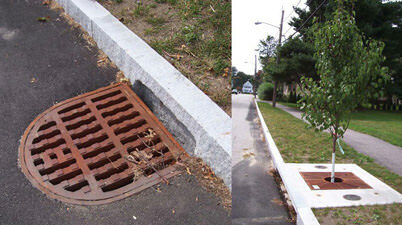 Each has its place and has some degree of effectiveness at helping to reduce stormwater pollution. The Watershed Association largely has chosen to identify areas to implement structural BMPs because they typically can treat much larger portions of the watershed, and thus larger volumes of stormwater. Since the Neponset River most often violates water quality standards with regard to bacteria, our projects focus on BMPs that best treat bacterial pollution. Fortunately, the practices that are best for bacteria are also some of the best overall BMPs and treat a wide variety of pollutants equally well. BMPs that best treat bacteria do so largely through filtration and/or infiltration. Water enters the BMP and undergoes a pre-treatment step that manages sediment, to help to ensure that the rest of the BMP doesn’t get clogged over time. The water either then filters through a soil-based medium or is allowed to infiltrate the ground. Different types of plants can be added to BMPs to absorb excess nutrients, like phosphorus and nitrogen. Although there are BMPs of varied styles and configurations, the basic premise behind treatment is relatively the same. In terms of effectiveness, BMPs that infiltrate are preferred, since they not only clean the water, but allow it to recharge groundwater supplies, keeping river flows more consistent. To infiltrate stormwater, porous soils are needed. Unfortunately, locations containing adequate space to build a BMP don’t always contain such soils. In those cases, alternative structures that filter stormwater, rather than infiltrate it, can be used. Bioretention cells (“biocells”) and rain gardens are both excavated depressions in the ground that have been filled with a special soil mixture and a combination of plants, which help to treat stormwater. Both structures may contain an outlet that leads from the stormwater treatment structure to a nearby waterway. 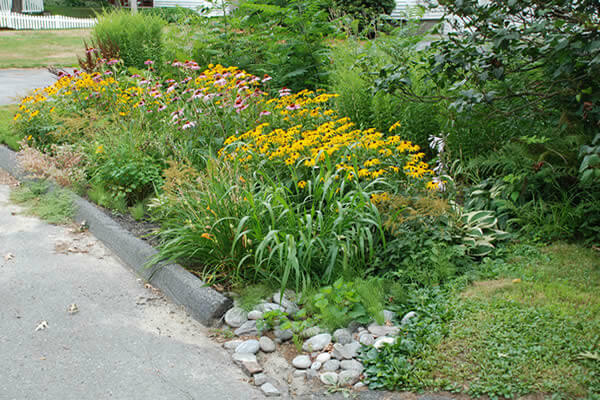 The plants, soil and soil microorganisms of the biocell or raingarden filter contaminants from the stormwater, and the cleaned water then either joins the groundwater or flows into an adjacent waterway. Tree-filter-boxes can be installed along sidewalks to receive and filter the water that runs off the street. Tree-filter-boxes consist of a concrete box, an outlet pipe, a special soil mixture, and a small tree or shrub. The tree roots, the soil, and microorganisms filter out the contaminants from the street runoff. The filtered water then flows out of the box, via the outlet pipe, enters an underground pipe system, and is released into a nearby waterbody. By filtering stormwater, tree-filter-boxes reduce the amount of pollutants that enter the receiving waters. Typical catchbasin at left, and water-filtering tree-filter box at right, Milton. A variety of other stormwater treatment structures exist. In fact, Neponset River Watershed Association Environmental Scientist, Chris Hirsch, has been hard at work, siting stormwater treatment structures around Neponset River Watershed communities. In addition to installing stormwater treatment structures, communities are implementing non-structural Best Management Practices, such as changing policies, and initiating public education campaigns to reduce the quantity of chemicals people apply to their yards and to people to properly dispose of pet waste. To learn more about stormwater treatment structures, contact Chris Hirsch at 781-575-0354 x302 or hirsch@neponset.org. Click here to learn about preventing stormwater pollution at your home or business.